Get some Brazil nuts into your diet! ​These nuts are the highest source of the mineral selenium (542 mcg, 774% daily recommended value in just one ounce!!). 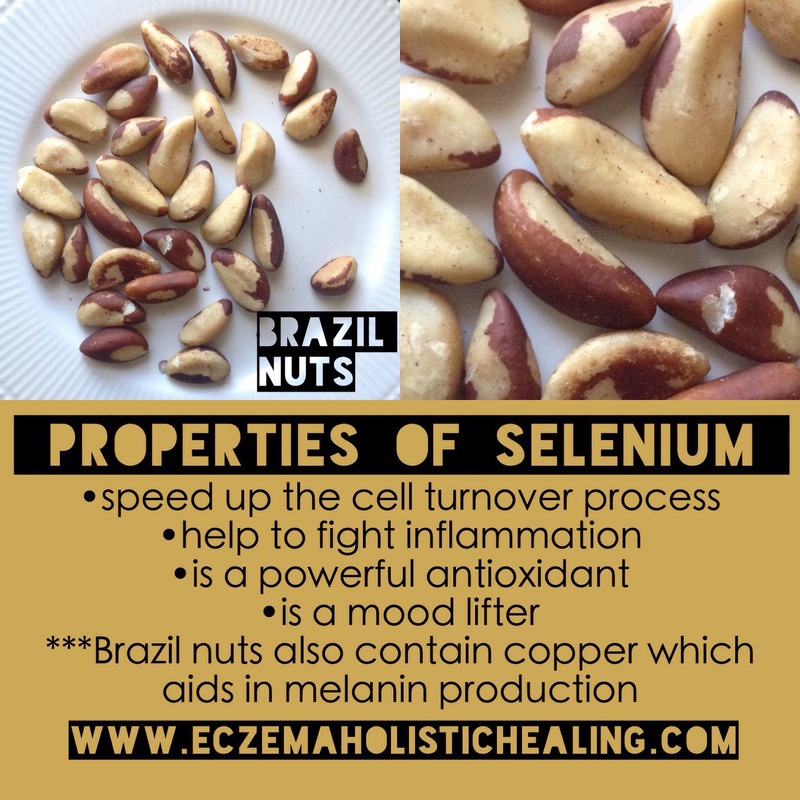 Selenium in Brazil nuts speeds the cell turnover process, providing a natural glow to the skin​ & helps with inflammation​.​ Selenium is also a great mood lifter which will help battle depression allowing it to boost the levels of serotonin metabolites. The high levels of antioxidants in Brazil nuts stimulate the production of glutathione, which combats free radicals that damage the skin collagen​ ​and ​helps to prevent skin cancer. The Vitamin E in Brazil nuts also maintains the integrity of the cells of the mucus membranes and the skin​​. Brazil nuts also contain copper, a mineral that aids in the production of melanin​ ​(a color pigment that protects the body from the harmful ultraviolet rays).​​ ​​I like to consume about 2 raw Brazil nuts everyday along with other nuts and seeds like walnuts, sunflower, chia, pumpkin & flax! Brazil nuts have a propensity to spoil quickly so buy them in reasonable amounts. Look for Brazil nuts that are stored in airtight containers, whole and brown and heavy in the hand. Don’t pick any that are shriveled or in pieces, as they could be already spoiled or contaminated with mold. It’s best to store Brazil nuts airtight in a cool, dark, dry place without exposure to humidity or sunlight.​ ​You can also store whole Brazil nuts in an airtight bag in the refrigerator, where they can last for a few months.